Welcome to your local beer guide aka Rochester Craft Brewery Adventures brought to you by: Linh Phillips from Sir Rocha Says (ROC food and drink blog) and Carolyn Stiles from Rochester Beer Gals (local women's beer tasting group). Given our mutual passion for the local community and a shared belief that Rochester has incredible breweries to spotlight, we decided to join forces and create an easy-to-use and helpful brewery guide of our local scene. Over the past year, we interviewed 11 brewery owners & brewers to learn their story, what makes them different, and taste their various styles of beer. The goal: to listen, to observe, and to enjoy every beer. These interviews led us to uncover more about the experiences that make up each brewery. Each one had its own defining personality and feel. It was enlightening, fun and took a lot more time than we ever anticipated. But, it was totally worth it because now we have an end result: a Rochester Craft Brewery guide that highlights 11 local breweries. This has been one heck of a journey and if anything, we hope that this guide helps you find your next beer spot, learn something new, and contribute to Rochester becoming the next beer destination. When Linh and I popped into Roc Brewing Co. on a rainy Saturday in June, the place was buzzing with the kind of contagious vibes that draw you straight to the bar for a pint. Even with the crowd, it’s easy to take in and appreciate, the cozy tasting room from the doorway. The space is brightly lit with natural light from the floor to ceiling windows, which frame a great view of the city (can you say perfect date spot to catch a sunset?) We were drawn to the rich dark bar made of reclaimed wood and the chalkboard wall, illustrating the brewing process. With an urban yet classic ambiance, owner, Chris Spinelli, has added a great attraction for the city’s increasingly young population. 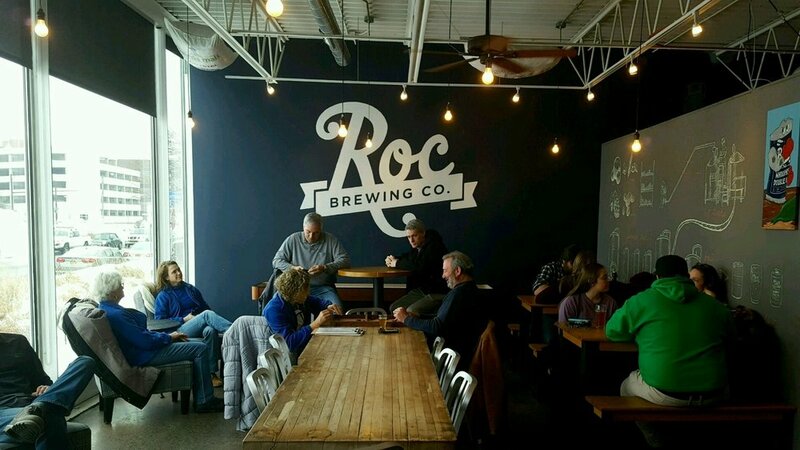 The Roc Brewing team constantly taps into the city’s energy, openly collaborating with the community and fellow brewers. They know it’s that symbiotic relationship that will keep the positive momentum going. Brewers Josh and Nick keep things real in the brewhouse, with a balanced tap list that caters to the hop heads, adventuresome drinkers and classic sippers alike. I will say that recently the brewery has become known for hop bombs like their IPA (formerly known as Badass IPA) and experimental combinations like Sassy Pants, a jalapeño mango IPA. But for those customers who say, 'Just give me a beer! ", there are some solid classics in the lineup that range from the Lagerithm Lager to their Mocha Porter. If you need some recommendations, Roc Brewing bartenders are always down to find you a beer to fit your palate, so ask for a taste or get a flight. Pick up any of the board games available behind the bar. Just ask your bartender! Roc Brewing hosts beer release parties for almost every new release. Get the first taste. Pair your beer with a Tot Waffle and yes that’s correct I said Tot Waffle. Loaded, ROC meat style, or Poutine….they all sound delish. When Geoff Dale (co-founder of 3HB) introduced himself as the “Minister of Mayhem”, we knew we were in for a good time. And really, a good time can always be had when you’re hanging at Three Heads or attending one of their raucous events. They’re all about inclusion and making sure everyone who visits their brewery finds a drink that’s right for them. This sentiment is also easy to spot in the design of their space, located in NOTA (Neighborhood of the Arts). It’s basically part brewery, part music venue, and part park (i.e. their patio, probably the largest in Rochester). At Three Heads, you’ll always find approachable, balanced beers, alongside more adventurous brews, which makes this spot perfect for a mixed group. What do you get when you combine two Phish Heads and one Dead Head? Three heads! Enough said. Fact: The Kind is the number 1 seller for 3HB. This beer basically built the new brewery. But, now that Three Heads has more control over the beers they brew, they’ve been able to tap into new styles (pun totally intended). With 15 available taps, you can find a mix of lagers and ales ranging from the light bodied Freddy D. Lager, a lower ABV, more sessionable beer, to bigger bodied, hop heavy beers like the Too Kind Double IPA. Not sure which one to try? No worries, a flight will help. Music is ingrained in the 3HB culture because who wouldn’t pair music and beer, right? So, hit up the brewery on the weekends to enjoy some live tunes. There’s a very warm and comforting feel about dropping into Stoneyard Brewing Company in Brockport. It's inviting and the cozy, den-like bar downstairs may entice you to stay far longer than you anticipated. But it’s worth it. After starting out as a brew pub in 2008, Jay (Stoneyard’s founder) pulled Oz (aka Jeff Osborne) into the fold to start brewing Stoneyard beers in 2014. Their similar palate for big hoppy beers was a perfect match and they’ve been going big ever since. When I say going big I mean it in every sense of the word. They tend to brew big flavored beers (think juicy hop bombs, Russian imperial stouts or a cream ale brewed with coconut) and they’ve taken on some impressive projects. 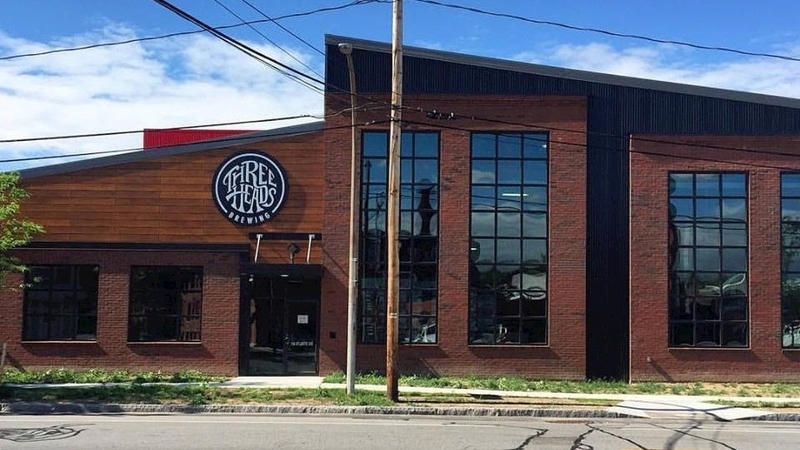 In 2016, they opened an American Craft Beer Hall in Webster, a breakfast joint in Brockport (Stoneyard Breakfast Co.), and started work on a 20,000 square foot brewing facility (to be completed soon). Jay loves to say that Stoneyard doesn’t do small, and he’s not kidding. 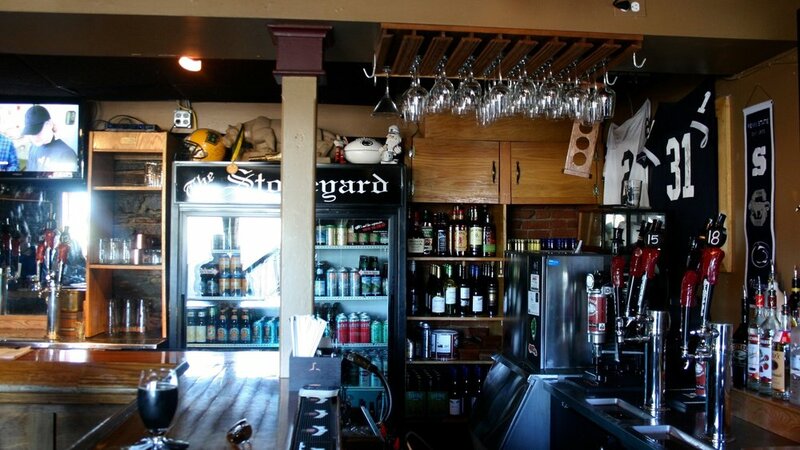 Stoneyard will make you feel right at home in their space, while pushing the limits of your taste buds through their beers. Like I just mentioned, Stoneyard (I mean Oz) gets really innovative with the flavors in their beer, and often pushes your palate to new places. However, I will vouch that they do an excellent job of achieving balance. While Stoneyard is known for their super hoppy IPAs, they spend a lot of time experimenting with other styles as well. It’s not uncommon to find a sour ale fermenting in brett infected wine barrels. But to be honest, if you're creative enough to figure out how to turn an elevator shaft into a brewing space (it’s literally tiny), you’re likely someone who would turn out some imaginative beers. 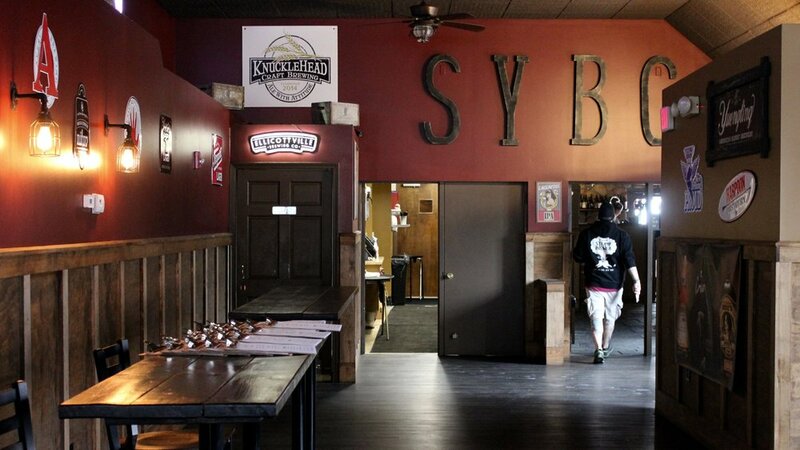 There are two locations from; the Stoneyard Tap & Grill (Brockport) or Stoneyard American Craft Beer Hall (Webster). Choose one, they’re both great! While Stoneyard beers are worth tasting, there are a ton of tap lines offering beer from other American craft breweries. 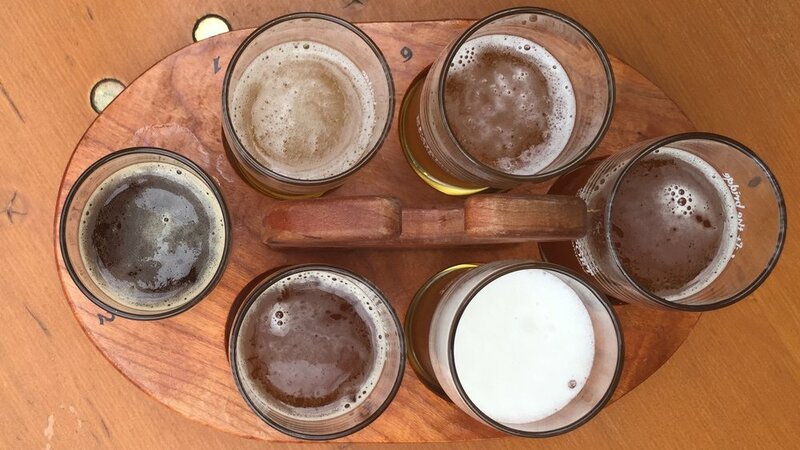 Your best bet might be to try a flight and feel free to ask your beertender for suggestions. Get some food! You can’t go wrong with the Cubano or poutine - can we say beer battered cheese curds? Brockport location: 1 Main St S | Open: Mon-Sat (11am-2pm), Sun (12-10pm). 585.637.3390. Rohrbach brewing company is no stranger to craft beer. In fact, with over 25 years of serving beer to the local region, they are Rochester’s original craft brewery. Owner and founder, John Urlaub, started the brewery in the basement of the German House back in 1991. The evolution of Rohrbach has been exciting to watch as they have expanded over the years with a brewpub/restaurant on Buffalo Road (1995) and a new brewery and tasting room in the public market district on Railroad street (2008). The newly renovated Rohrbach Beer Hall will welcome you with pints of beer, wood-fired pizza, and live music. Whether you’re visiting the brewpub or the Beer Hall, you will surely be ‘Bach’ for more! One of the first local beers I was ever introduced to was Rohrbach’s Scotch Ale. This flagship beer, along with classics like the Highland Lager, Railroad Street IPA, Blueberry Ale, and Vanilla Porter, is a fixture in our locals’ beer repertoire. You can’t visit Rochester without having one of these. The brewery continues to set the tone for craft beer in the area and has pushed the boundaries outside the classics with newer brews such as the Space Kitty, an American Double IPA with bold flavors and fun packaging. Don’t be afraid to check out their seasonal, neoteric and small-batch beers as well! Rochester’s historic public market district is home to many local neighborhood treasures. Where else can you grab a beer, tour through a local distillery (Black Button Distilling) and peruse through the market for delicious goodies? What happens when you combine yoga & beer: Brewga! Whenever I wander into Swiftwater Brewing, I always feel like I’m in the right place. Sure, that’s partly because I’m looking for a beer, but also because there’s a welcoming and inviting vibe at Swiftwater that I love. I think it’s due to the balance of elements in the space and the wonderful crew of bartenders. There’s a bright, urban, industrial feel that comes from the huge garage door, high ceilings, concrete floor and open brewing space which is not lacking in stainless steel. But among the modern, industrial components, there’s warmth to the tap room as well. It’s from the softly colored walls, cozy booths, and the wood that’s present everywhere, from tables, to flight racks, to the handmade wooden bar that dominates the room (clearly stating where you should head upon arrival). It feels comfortable and welcoming and if you haven’t yet, it’s a brewery you’ll definitely want to experience. Order a beer off their chalkboard wall and pair it with something from their farm to tablish menu. Then settle in at the bar or out on the patio if it’s warm, and enjoy; you’ll find it hard to stop at just one. Swiftwater’s brewing philosophy is to offer some traditional beer styles that satisfy the middle-of–the-road drinker, while throwing in some creative, out-of-the-box beers that push your palate. Traditional styles? We’re talking IPAs (look for some in bottles), session pale ales, or lagers like doppelbocks and pilsners. When we say out-of-the-box, we’re thinking raspberry sours, wild yeast fermented, barrel-aged saisons, or Thai-spiced pale ales. Our common tip? Consult the knowledgeable bartenders and order a flight. You’ll see a variety of games piled on the shelf next to the garage door. Snag one on your way to your table and let your inner champion come out. Thursday night is record night. Listen to some classics from the house record collection or bring your own. Rochester’s warm season is short, so take advantage of the patio while you can. Plus, the green canopy formed by growing hop bines (aka vines) is pretty magical. There’s a lot of collaboration in the craft beer world, and Swiftwater is no different. You’ll often find a recent collab beer on the tap list. They’re always limited release so be sure to try them while they last. Spell Nedloh backwards and you’ll discover the last name of owners, Nate & Josie Holden. With strong influences from the wine and beer world - Nate, a beer aficionado from Vermont, and Josie with her background in wine - the natural next progression in their life was opening a brewery. Nedloh Brewery was built from the ground up and opened in 2014. It can easily be spotted off Route 5 & 20 in Bloomfield with its distinct yet beautiful architecture. Walk into the expansive tasting room and you’ll find vaulted ceilings, large windows, a chalk paint mural from a local artist Sarah Rutherford, and a panoramic view of their hop field. Nedloh’s backyard is actually Holden Farms with 4 acres of locally grown hops and a garden of vegetables. Pretty darn cool, if you ask me. This brewery is worth the drive and experience as a place to come and just chillax with your friends and family. Here you can find a range of beer offerings. There are classics, like porters, saisons, and IPA’s, as well as more innovative styles from their barrel-aging program, experimental beer series, and Nitro tap line. Nedloh is not afraid to push the boundaries. The barrel-aging program uses a variety of spent barrels, including whiskey, gin and tequila among others. The result of using these barrels is a more nuanced beer that will excite your taste buds. Must-trys are the 5&20 IPA & the Gin Barrel Aged House Saison. Smokin’ Jams is an event with live music and barbeque that happens every other Friday in the summer. I’m there! Picture this. It’s a bright & sunny day in the village of Pittsford. You’re walking down the canal path and all you’re craving is a cold, local beer. Well, you’re in luck. Lock 32 Brewing Company is conveniently located in Schoen Place. Owners, John Clark, Seth Clark, and Casey Dunlavey turned their love for craft beer, which started by drinking beers on the back porch, into a thriving, community supported brewery. Celebrating 3 years this past March, they have much to be proud with their lineup of beers and explosive growth in this short time. The location here is dynamite as you have a spectacular view of the Erie Canal. The wide open window gives you a stunning view and there is nothing like feeling the breeze against your face as you sip on a delicious brew. So pull up a chair, grab a flight of beers, and take in all of the beauty and richness of Lock 32. Lock 32 aims to welcome all palates and have options for anyone who visits them. Their brewmaster, Phill MacArthur strikes the perfect balance between easy-drinking, sessionable, and hoppy beers. Given the space limitations at the tasting room, Lock 32 contracts with Custom Brewcrafters to utilize their brewing system. When Carolyn and I were asked to guest ‘beertend’ here, we served up crowd favorites likethe 5 Eighty 5 Dry Irish Stout and the Flower City American IPA. You best try them. I mean, the VIEW alone should make you come visit. Community Pub feel. Chances are, you’ll become best friends with the person sitting next to you. Everyone is that friendly here. Knucklehead has all the welcoming feelings of your best friend’s living room, and there's a very good reason for that. The theme that most accurately describes Knucklehead, is family owned. If you happen to wander in on any given night, it’s not uncommon to see one of the owners, George or Len, welcoming you from behind the bar. Order something off the menu? It was created by Len’s son, Josh, who runs the kitchen. And the face that brewed your beer? George and Jake (Len’s son) are your guys. There’s family threaded throughout and it’s recognized by the local community who fully support the brewery, keeping the bar filled. In turn, Knucklehead has embraced the local community through collaborations with other local brewers and participation in fundraising events. There’s a clear passion for making connections locally. So, cross the bay for an afternoon, pull up a seat at the bar, and settle in to enjoy a beer or two with some pals. Knucklehead always has six flagship beers on tap and a few seasonals. Most of their beers are easy sippers, even the hoppier options, and usually won’t push your palate over the edge. Customers can’t get enough of Kathy’s Kreme Ale (named for Len’s wife) or Ehret’s Amber (named for George’s ancestor who was a brewer) - both best sellers. All of the beer names have meaning often relating to a family member or the community. “A proud Rochester staple.” I’m quoting General Manager, Malcolm Franklin, of Genesee Brewing Co. and honestly, I can’t agree more. Basically the OG of local brewing, Genny Brewhouse has reinvented itself in the last few years. 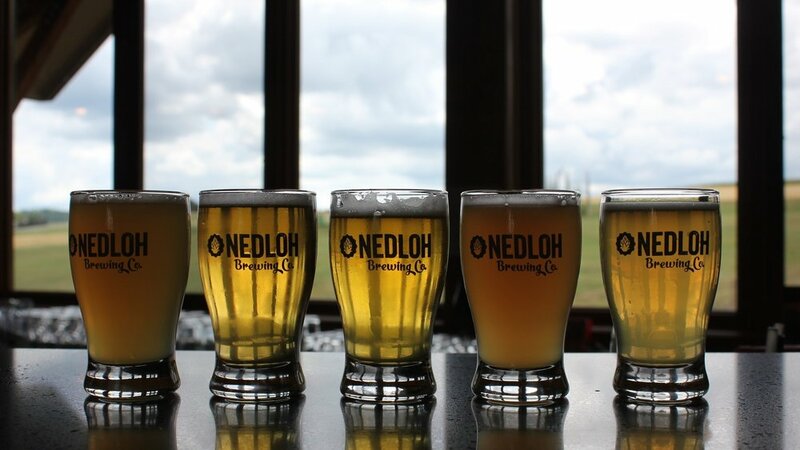 Not only are they making a name for themselves with the craft beers they’re brewing, but they’re also helping to build the local craft scene by opening up their facilities to other local brewers; think tasting panels and quality assurance labs. Pretty. Awesome. So, knowing how iconic it is, if you haven’t been over to the Brew House in High Falls, you’re not a true Rochesterian. This is like a rite of passage! Genesee Brewery is a place of American heritage and the interior aligns perfectly with that. There’s a classic feel with dark wood tables and a long wooden bar that make the space warm and inviting. Great for a group. Its menu is the same way, starring comfort foods that are always reliable - and, um, don’t miss those pretzels. The history and memorabilia featured downstairs is an experience by itself, which can be enlightening and inspiring. Don’t miss the rooftop - it has one hell of a view reminding us of one more reason why we love this city. Genesee brews dependable solid beers. We’re talking about a lot of balanced, easy drinking, German style beers and that’s what Dean Jones, head brewer of the craft brewing system, truly geeks out on. However, he can’t help but let his creative spirit get the best of him; heard of the Chocolate Caramel Porter or Lilac Honey IPA? Two stellar examples of those creative juices flowing. Expect the beer offerings at the Genesee Brew House to be approachable and comforting, enticing locals and visitors alike to stop by this Rochester staple. The Rooftop! Need we say more? The view is unbelievable! Get a tour of the Pilot Brewery where craft beers are brewed for the restaurant/bar upstairs. Leave with just enough knowledge to impress your buddies. The holiday keg tree! Picture a massive Christmas tree built with kegs and adorned with lights; this spectacular sight is a must-see during the holidays. The Lost Borough Brewing Co. started out with simple beginnings; a Wednesday night ritual of guys’ night & tasting craft beer. This beer adventure would later evolve into home brewing, a business plan, and a new dream for co-owners and lifelong friends: Dave Finger and Dan Western. Carl Langsenkamp, would later join the team through their Kickstarter campaign, opening their doors in November 2014. The name itself, “Lost Borough” was born out of an old nickname of Rochester in the 1800’s, tying into the heritage and skyline of the city within the logo. Walk inside and you’ll find a taproom uniquely designed, with every inch hand-built with love from the owners. The industrial concrete bar and the reclaimed barn wood tables give off a cool yet comfortable vibe. The brewery welcomes new patrons, beer aficionados and really anyone looking to engage in a new beer experience. Also, don’t be shy to bring your kids – everyone is welcome. These guys pride themselves on delivering beers that cover a wide range of palates that customers will not shy away from drinking. Whether you are new to beer or have been imbibing for a while, you will find a style that appeals to you. Two of their signature and most popular brews are must-trys: the Hopchester (British Style IPA) and Park Ave Pale Ale (PAPA). Personal favorites of our own include: the Space Nugget a DIPA (Double IPA) intense with flavor and hops and the Peanut Butter Porter, because who can say no to peanut butter. Through experimentation and crafting over 40+ styles of beer last year alone, the quest for the perfect ale is constantly being refined. In every new business, you get better over time, learning more about your equipment, your consumers, and your beers. With that said Lost Borough has upped the ante and their beer game is stronger than ever. Check them out. Darts, Board Games (You sunk my battleship! ), Ring Game, Jenga. There’s more than enough to keep you occupied for an afternoon. From unique food pairings (ice cream & beer, heck yeah! ), Hoppy Hours, Namaste at the Barre (Barre & Yoga Flow), local fundraising events, brew classes…you will surely find an event to your liking. The Brew Crew isn’t your ordinary mug club. Membership includes a killer stainless steel mug, exclusive savings, free pints on special occasions, and then some. The Borough Runners are the craftiest running group around. Every Thursday you can go for a 2-4 mile run with others and then treat yo’self to a cold one. Nestled in the heart of Fairport is a brewery that brings together two important elements: hand-crafted beer and community. 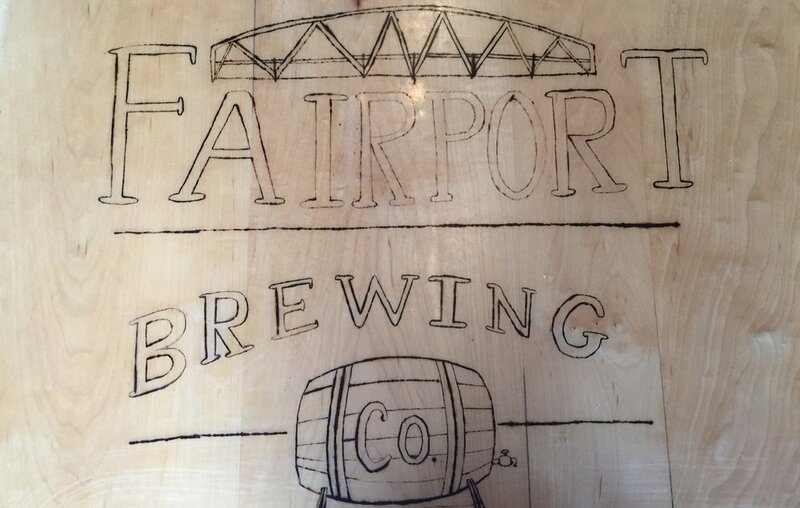 Fairport Brewing Co. is the brainchild of owners, Tim Garman and Paul Guarracini, who transformed this former gas station into a now iconic part of the village over four years ago. The owners got their start in the beer business through years of home brewing. Carolyn and I visited together on a warm summer day and were immediately drawn to the outdoor patio with Adirondack style chairs – trust us you’ll NEVER want to leave. Inside you can find their take on an English style pub, with the cozy feel of the historic building, high-top tables and a small garage door window that opens to South Main Street. There’s something majestic in feeling the wind on your face as you look out into the village with a cold brew in tow. This is a favorite neighborhood spot where you can hang with your village brewer and chill with the locals. Does it get any better than that? “Here, you’ll find a beer for everyone. Our goal is to find one you like”, says Paul Guarracini. And they stay true to that brewing philosophy. Frequently turning over their tap list, you can always count on 6 styles to choose from: golden, amber, dark, pale, IPA, and specialty. Paul is more of a classic brewer with a taste for English and German beers, whereas his head brewer, Wyatt has a more innovative style focused on IPA’s and Sours. Together their approaches complement each other well. Their love for the Fairport community is evident through many of the beer names like the ‘Raiders Red’, an Irish red, which is their #1 selling beer. Try out the ‘Fair Porter’, a dark brown beer with nutty, caramel notes that could pair nicely with some BBQ. Not in the beer mood? They also make Timbucha Kombucha, a natural probiotic drink with flavors like cranberry pear, citrus, and peach. The Fairport Village sits right on the canal path and is GOREGOUS; whether you're a local resident or just visiting for Fairport Canal Days or the Fairport Music & Food Festival you will fall in love with this town. We hope our guide was helpful and has encouraged you to try something new. If anything, we hope it made you extra thirsty for a delicious, local beer. Cheers and hope to see you around Rochester, touring through the breweries with your new guide.